I offer customers more for less. Customers get my extensive experience at less cost because of low overheads. My skill-set gained over many years of graphic design and advertising, help create the best website for you. The skill-set includes: logos, advertising, branding, corporate image design, animation, exhibition design, cartoons and drawing, publications including brochures flyers and annual reports, radio scripts, slogans, TV production and of course website design and production. You get those all those skills just because you enquired about my web skills! 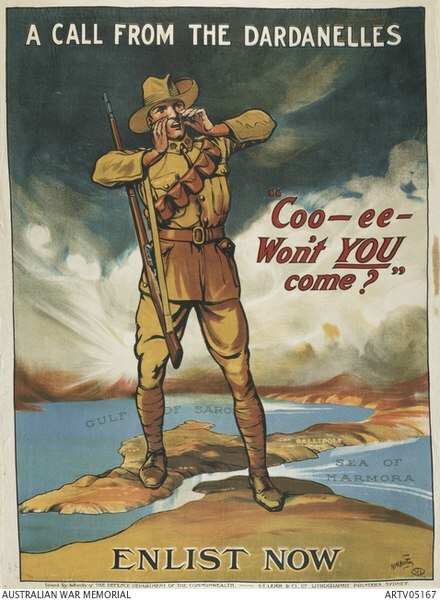 Australia World War I recruitment poster depicts an Australian soldier in the Dardanelles using the “Coo-ee” to summon reinforcements from Australia, 1915. Cooee! Is a shout used in Australia, usually in the bush, to attract attention and find missing people, or indicate one’s own location. When done correctly – loudly and sure shrilly – a call of “Cooee“. The word Cooee originates from the Dharug language of the original inhabitants of the Sydney area. It means “come here“, and has now become widely used in Australia as a call over distances. Is known among white settlers in colonial times and refers to the aborigines of Sydney calling to each other in this way. It can carry over a considerable distance. The distance one’s Cooee call travels can be a matter of competitive pride. It is also known as a call for help, which can blend in with different natural sounds in the bush. At my stage in life, I’m what you call semi-retired. But I still love design and creating great stuff for people, not to mention a need for a little extra cash! I only work on projects I have a passion for. I spend a lot of my time on charity work for The Rotary Club of Canberra Burley Griffin, mainly the establishment of a Canberra Rotary Peace Bell. Like to know a price? I firmly believe in discussing price up-front. While there are many variations that can be included in a website, I have a few set-price options. I also include a ‘price calculator’ on this website so you can work out your own budget. No matter which way you look at pricing – you get what you pay for – quality takes time. I charge Australian prices for an Australian product.